At Japanese Healing, our motto is “no pain and lots of gain!” When performed by a seasoned acupuncturist, you will find acupuncture to be very gentle and relaxing. Did you know that acupuncture needles are as thin as a strand of hair? At 1/5th the thickness of injection needles, they are extremely thin and can smoothly penetrate the skin without any discomfort. Acupuncture needles are single-use, disposable and sterile. Our clinic uses Japanese SEIRIN acupuncture needles, the highest quality needles available in the world. Unlike other manufacturers, these innovative needles have a round needle-tip which allows for a smooth, painless needle insertion that doesn’t damage tissues in the body. 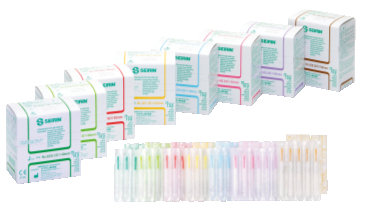 The product of state-of-the-art manufacturing technology with stringent processes and controls, SEIRIN needles are the smoothest, safest, and most advanced acupuncture needles available in the world. When receiving acupuncture, patients can often experience many different sensations. Depending on the aim of the acupuncturist, that sensation may also differ. Some practitioners seek to create a dull, achy, and heavy sensation at the site of needle insertion. At our clinic, however, Dr. Komatsu seeks to provide the most comfortable experience for his patients. When needled by Dr. Komatsu, patients hardly experience any needle sensation. Instead, they often report feeling a lightness and deep relaxation spreading throughout the body. We invite you to visit Japanese Healing and to experience this painless and immediate-acting acupuncture for yourself!